Who doesnt like pretty jewellery? Obviously many cant resist as international hand-finished jewellery brand Pandora has officially made it's one year mark in Kota Kinabalu! The 11th boutique store in Malaysia, the Danish jewellery company first brought their delightful trademark charms to Malaysia in 2010. With the tagline Unforgettable Moments, Pandora prides itself on producing charms suitable for every treasured moment, and so far there are over 800 different charms to choose from! The new Summer 2013 collection "A Tale By The Sea" is oceanic and beach themed with gorgeous marine blues! Made out of genuine sterling silver, you just have purchase the special bracelet "base" and you're on your way to building your own special story on your wrist! An example of how you can create your own perfect set of earrings! What makes Pandora stand out from the rest? For me, it's the fact that every piece of jewellery you purchase from the brand is flexible and you can recreate all kinds of different looks for every occasion just buy threading different charms on your base bracelet/earrings! You can also choose the leather bracelet if silver is too mainstream for ya! I cant wait to start building my story, but for now, I have something special for my lovely readers: A RM100 gift voucher from Pandora to kick start YOUR journey! I personally love this bracelet paired with this charm, even though it's a bit daintier than my norm! The voucher is valid nationwide, and this giveaway will end on the 4th of July so what are you waiting for? Can't wait to hear from you! 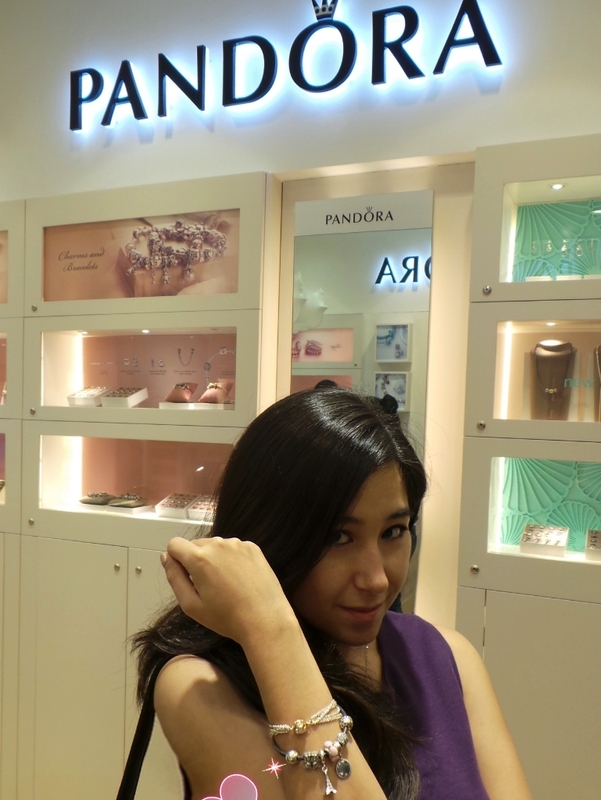 For more info on Pandora, you can visit www.pandora.net or LIKE their fb page Unforgettable Moments - Malaysia. Followed, my unforgetable moment for this year.....2013 is the year that I started my degree! Finally I make it to this level and I want to enjoy my campus life to the MAX! Unforgettable moment for this year of mine so far was knowing someone special that brought me from the lowest time to a better me, today. My most unforgettable moment this year so far has been buying my Mum a latest Pandora charm from their Mother's Day collection for her during the last Mother's Day festival to add to her ever-growing collection of charms on her new silver Pandora bracelet! Her expression upon receiving the gift was priceless! She simply adores the stuff so my siblings & I make it a point to give her a new charm on every occasion. 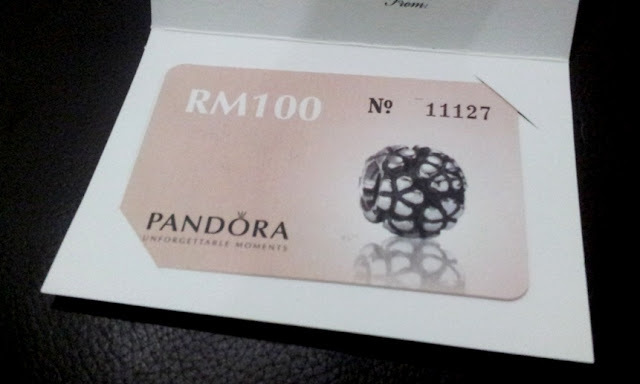 Let me win the RM100 gift voucher from Pandora please so I can excite her with yet more Pandora! But is the truthhhh...lolll...hey..m i folowing u yet? cant seem to tell for sure.. The most unforgettable moment of 2013 so far has been the day I became an intern with Nuffnang. Although it was only for 3 short months, I felt like I was in heaven; a place I would have never fit in well yet I was accepted with graceful hands and made to feel like family. Till today, I cannot thank my co-workers enough for helping me ace my internship semester with flying colors. Unforgettable? You bet it! P/S: Maybe now it'll be even MORE unforgettable if I win the voucher! Wow, Nuffnang! I can just imagine the fun and amount of events you experienced there! I was lucky enough to meet 2 of the Nuffies when they came to KK for an event.. They were crazy fun and we still keep in touch til today! Hi Calista! I've just followed your blog. I hope I'm still in time (And in luck) to qualify! Hi calista could you please check if i have followed you. I think i hit on the button but im not sure if im in. Lol! Thanks a bunch. The most unforgettable moment so far this year was my grandmother passed away. Although she was gone,the great memories for she and I will always keep with me. My sincerest condolences for your loss.. Cherish those memories! I thought i would be as tough as rock wall. I told myself to restrained myself from falling again for another guy..but i believe in faith..thought it would be hard for us to keep our relationship since he is japanese and still studying in japan..but..who cares.....!!!! We're happy...thats all that matter!!! OMG, i just saw this post~! Am i too late?